Geef mijn portie maar aan Fikkie! In this phrase "Fikkie" is a dog and it seems to be the name of choice when referring to a random dog 🙂 A "portie" is a "portion/dose/serving", so when you no longer want to participate or be a part of it, you give your share to… the dog. Usually you use this phrase when talking to somebody else about whatever it is you quit. – "Ja dag! Mooi niet, geef mijn portie maar aan Fikkie!" – "Ik heb echt alles geprobeerd, maar niets wat ik doe is goed. In haar ogen blijf ik een hufter. Nou weet je, als het zo moet, geef mijn portie dan maar aan Fikkie." – "…En nu doet hij alsof het allemaal zijn idee was! Nou ik kap er mee, geef mijn portie maar aan Fikkie!" – "Als jij in de achtbaan wil, prima, maar mij niet gezien; geef mijn portie maar aan Fikkie!" – "Mij niet gezien": literally "not seen me" you can say this when you don't dare to do something and/or when you rather leave it to somebody else. – Portie: portion/serving/dose/share [noun] [de portie, de porties]. – Hond: dog [noun] [de hond, de honden]. – Geven: to give [verb] [gaf, gegeven]. This entry was posted in Dutch phrase of the week, DWOTD 1.0, Vocabulary Guru and tagged Fikkie, geef mijn portie maar aan Fikkie, portie by Sander. Bookmark the permalink. Is Fik also a nickname in The Netherlands? In Belgium “old dogs” of the local village, or wherever, (like DWOTD’s own infamous Frank) may become known as Fik. In my wife’s home village for example one of the local characters is Fik van Kreppen. I don’t know about other English speaking countries, but in the US, to refer to a random dog, one uses Spot, Rover, or Fido. 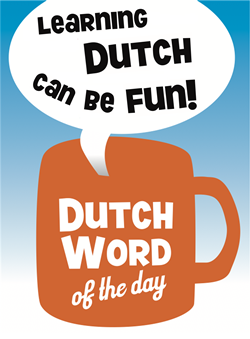 I’m a Dutch native, well educated and good communication skills but I have never in my life heard of this phrase. The author of this weblog must live in Amsterdam I think because this is truly ‘Jordaan’ slang. Not every expression we cover is necessarily widely in use, sometimes we cover it when we think it’s a fun expression, or just to prepare our readers to understand what is being said. In case of rare usage, we assign the category GURU to the word. We do have the rule that (in principle) words and expressions must be listed in the Van Dale, which is the case for good old Fikkie. To break into this discussion after a couple of months (just discovered this site and having fun with it), as a northerner (Frisian) I’ve heard (and used!) this expression many a times.